While some people manage to fast with very little difficulty, others find it to be a huge challenge. Although fasting can deniably be difficult, a few simple tips will definitely make it easier for you. 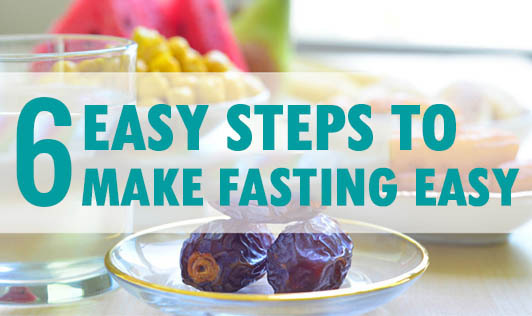 Here are 6 tips to make fasting easier for you. 1. Keep yourself well hydrated- Water is most essential for the body. A person can stay without food for a few days but not without water. Water loss is the main reason why most people get uncomfortable during fasting and therefore hydrating is the key. Also, it is seen that water also keeps your stomach full and doesn't make you feel hungry. You are recommended to take at least 8-10 glasses of water throughout the day. 3. Keep your protein and fiber intake high- Choose foods like amaranth (rajgeera), samo seeds (vari) and fruits in the diet which are rich in fiber and protein over high carb foods like sago which lack fiber. Choose complex carbohydrates over simple ones as they are slowly digested and keep you full for a longer time. 4. Avoid fried and salty foods- Fried and salty foods trigger thirst sensation and leave you feeling thirsty and uncomfortable. 5. Control your thoughts- Avoid thinking about fasts and hunger. Thinking about hunger and fasts will make fasting more difficult. Distract yourself from food by meditating or immersing yourself in prayers or work. 6. Break your fasts wisely- Make sure you break your fast wisely. Always eat slowly and avoid over eating during fasts. Have same kind of meal like other days and avoid splurging on calorie dense delicacies. Follow these tips for a successful and meaningful fast.